The U.S. Navy’s Coastal Surveillance Force (Task Force 115) was established in 1965 to perform operation Market Time, the detection and blockage of Communist seaborne infiltration routes. P-3 Orion aircraft patrolled the waters furthest from the shore, whilst Coast Guard cutters and Destroyer Escorts were used to interdict large trawlers. The Vietnamese Junk Force and U.S. Navy Swift Boats (PCF - Patrol Craft Fast) operated in the shallow coastal waters, stopping, searching and seizing suspect vessels. 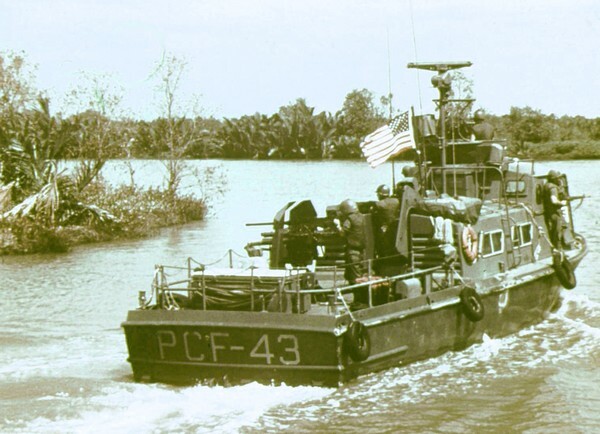 In November 1968 Task Force 115 craft began operating in the larger rivers of the Mekong Delta as part of operation Sealords, which severed Communist infiltration routes from Cambodia. Beginning in October 1969, Market Time’s boats were gradually turned over to the Vietnamese Navy (VNN) in accordance with Vietnamization.